Drilling with a drill press has made woodworking convenient and easy. Not only wood, but it can also be used for drilling holes on large substances like metal. Drills work by rotating spindle which is usually clamped in a vise resting on a table. A drill may be gripped in a chuck with three jaws or tapered shank that fits in a tapered hole. Whichever it is, the means are used for diversifying the spindle speed. There are numerous drill presses available in the market and if you already have one you might have felt the necessity of a drill press stand. A drill press stand for drill is essential to secure the position of your drill press and let you work with safety. You can keep an adjustable guide for your drill press to disassemble it whenever you desire. Block the guide with two carriage bolts to secure its position and prevent from turning when tightening the knob. A screw is used to attach or remove the adjustable guide. You can use four bolts to hold the drill to the base which is made of MDF. 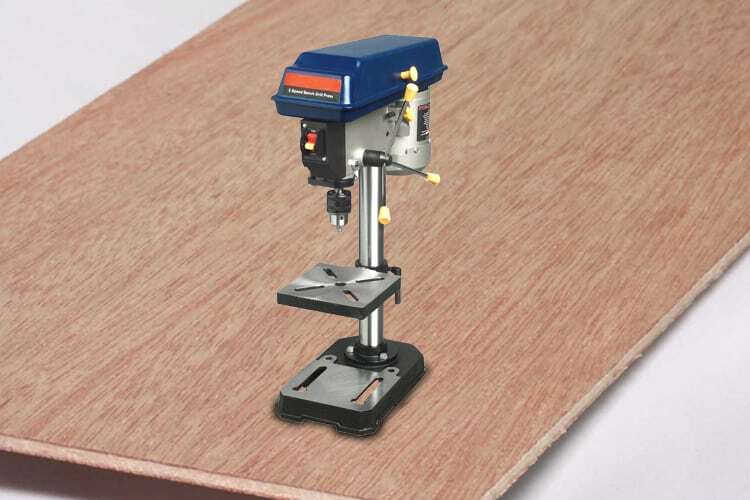 It is very much essential to ensure that drill press stays stable in its place. A table made with HPL panel can be perfect for your stand. It is also called Trespa which is a compact board and strongly built with resins and wood fibers. Plywood can also be considered in this case. Then you have to adjust the height and depth of the drill, make sure that the bit touches the piece and reset the knob to 0. Take a definite depth based on your requirement and lock it to work with it afterward. This is close to being one of the most important steps. To make the drill, adjust the guide and then make it. If you are willing to make a deeper drill, you have to use two clamps for that. Two clamps are used to hold the piece to the guide. This lets you drill mostly and safely. You might be glad to know that the drill press can be used for sanding purpose as well. With that regard, you have to use a sanding drum to use it as a sanding station. You can do it with the help of a 3D router. Add dimensions to your woodwork and curve the parts to enhance its beauty. As you have read the instructions, you might have thought that drill press stands for drill can be very much useful. We hope that we have provided enough information for you to understand the importance of a drill press stand and make one for using with the drill press and other accessories and use the drill press for various purposes.